A resource guide to help you get back on your feet after you have braved the storm United Way of Greater Houston has created After the Storm for you to use as a resource toward rebuilding your life. Whether you are trying to provide basic needs like food, shelter, and clothing, or you are struggling with the stress that is a major part of crisis recovery, you will find important and helpful information in this booklet. The entire content of this booklet is also available on the web HERE —for your convenience. The 2-1-1 Texas/United Way Helpline is always available, 24 hours a day, 7 days a week. Let 2-1-1 be your first call when you don’t know who to call. Trained HELPLINE specialists are always available to listen to your questions, understand your needs and help you identify resources that are tailored for your specific situation. There are no words that can ease the losses you have experienced. Please know that there are many resources that can help you take those difficult steps toward recovery. United Way heals the past, shapes the future and makes today better for us all. Please know that United Way is here to help. Hurricanes…tornados…earthquakes…tropical storms…floods…when the forces of nature are unleashed, the results are often devastating. There is little anyone can do to prevent or reduce the power of these natural disasters. This booklet is intended to serve as a guide along the path to recovery. Living through a major crisis produces many different types of feelings. You may feel anxiety, depression, confusion and tension. These feelings may cause a breakdown in our usual coping mechanisms. You may find it hard to function, behave in unexpected ways or have trouble making decisions. Although a crisis can result in a sense of anxiety, pain or hopelessness that makes it hard to cope, these same feelings can serve as motivation to look for help and develop new coping mechanisms. That’s where this guide comes in…we hope you will use it to guide your steps as you begin the rebuilding process. The United Way put together these checklists as a guide during recovery. Get Into a Routine During this difficult period, it is especially important that you take care of yourself. As quickly as possible, resume your usual activity patterns. Establishing a regular routine will help you and other family members begin the recovery process. Try to eat properly. Choose foods that include the basic food groups and offer a balance of fruits, vegetables, protein, carbohydrates and other essential nutrients. Limit junk foods, especially for children, and drink plenty of fluids. Healthy eating will help you rebuild your strength during the trying times ahead. Sleeping away from familiar surroundings can be very difficult. Make every effort to get as much sleep as possible so that you will be rested and able to face each day’s challenges. Return to regular sleeping times as soon as you are able to do so. This will help your body refresh and restore itself. Although it may seem that fate has taken charge of your life, it is essential that you reassert control as quickly as possible. Begin to plan for your recovery, even though you may feel that there is little you can do. Assess the damage you have experienced and identify resources that are available to storm victims. Make a list of tasks each day so that you can celebrate small successes as you build up to larger accomplishments. Share your feelings with others. Everyone affected by the disaster has a story to tell. Do not hesitate to share your experience and be a good listener for others who need to talk. Be open about your concerns, ask questions and express your emotions as they surface. You know how overwhelming the disaster has been for you as an adult. Be sensitive to the fact that your children may be particularly in need of your love and attention. Encourage them to talk about their fears. Acknowledge their losses and allow them to take an active role in the recovery process. The structure of a regular routine is especially important for children. Be sure they eat properly and get enough sleep just as soon as conditions permit. At times like these, lots of extra hugs and kisses can be very therapeutic for you and your children. The experience of homelessness for those who have been forced out of their homes as a result of a natural disaster is particularly devastating. Suddenly, in spite of years of careful planning and saving, you may have lost your home and its valued contents. You may have lost treasured mementos and cherished possessions that are an important part of your history. If this is the case, you have reason to grieve. While no one can truly recapture all that you have lost, there is help available to help you begin again. FEMA (Federal Emergency Management Agency) If your area is declared a national disaster, you may qualify for financial aid. You are encouraged to apply for FEMA assistance or aid, regardless of the extent of the disaster you experienced. People who suffered damages from the storms are eligible for assistance through various programs offered by FEMA. If you are a renter, you may be eligible for a grant from FEMA to cover Short term rent assistance at a new location. The process involved in applying for FEMA may seem time-consuming. However, you may be missing an important source of financial assistance if you fail to take advantage of this opportunity. When you apply, please have the following information available:  Social Security number  Current and pre-disaster address  Telephone numbers where you can be contacted  Insurance Information  Total household income  A routing and account number from your bank (only necessary if you want to have disaster assistance funds transferred directly) Call the FEMA Helpline or check online if you need additional help or have questions. You can also learn the status of an application, additional services, or the location of specific services. You can also apply online at www.DisasterAssistance.gov. The American Red Cross and the Salvation Army are two organizations that offer a variety of resources, particularly during the early stages following a disaster. Be sure to contact both to determine whether their services meet your current needs. So now you have this gorgeous patio, outdoor kitchen and beautiful living space, right? At the end of the day you go inside and carry on with your life … so who’s cleaning your outdoor living space? Not you! We hear that it’s “out of sight, out of mind,” so the cleaning of your patio is put on the back burner of your new grill. Cleaning and maintaining your patio is important though! Our friends over at Sweet Tea Patio Co. have a special offer for Texas Custom Patio customers. Just say you saw this blog and receive 20% off grill cleaning! Sweet Tea Patio Co. is a full-service outdoor cleaning company. Just as a maid would detail your home, they offer the same level of detailing for your outdoor living area. Upscale patio cleaning, removing pests and pollen, cleaning your windows, power washing your deck and siding, scrubbing patio furniture, polishing granite and stainless steel appliances, and all the other dirty work. Truly a unique service catering to patio lovers! More About Sweet Tea Patio Co. This cleaning company was developed from a need. A need that presented itself from their own love of outdoor living spaces. They took great care in the design and development of their patio and the results were amazing. They found more and more that their family and friends loved it too, everyone wanted to use their outdoor living area for birthdays, holidays, and to watch sporting events. It never failed every couple of weeks we were dealing with new spider webs, pollen everywhere, leaves and dust, we had it all. Most of the time doing a deep clean it took equipment and time we usually never had. As we searched there was no one company that specialized in or did “top to bottom” patio cleaning or were capable of handling the daunting task of cleaning the outside in a way that held to our standards. So Sweet Tea Patio Co was created… a service that caters to people just like us — patio people. Sweet Tea Patio first got their hands dirty in 2015. They are a new business, but are rockin’ & rollin’ (errr … cleanin’ & sweepin’ we shall say). We hope you will give them a shot! Enjoy your clean patio without all the hassle! Before you stack the s’mores and fire up that outdoor fire feature of yours … let’s make sure it’s a safe and clean one! Houzz recently wrote up a great blog about keeping your indoor fireplace tended to in a tidy fashion. That’s a hot topic as the climate cools in Texas, which got us to thinking … your outdoor fireplace or fire feature is just as important to keep clean and safe! A clean fireplace is a safe fireplace. Not only does a clean fireplace look best, it also functions best. It’s tempting just to leave ashes and leftover wood in the fireplace between fires but it’s best to remove the chunks and sweep the ashes once the fire is completely extinguished and cooled. Having a set of tools specifically used for fireplaces will speed this process along. Now this may sound crazy, and you would be surprised at just how many people do this, but should NOT! Never use a vacuum cleaner, even a shop vac, to clean ashes as embers can stay hot for days and can reignite inside your vacuum. While most people can start a fire it is essential for the health of your fireplace to build the right kind of fire. Hardwoods are best for burning in your fireplace. They burn hotter, longer and cleaner. Learn to build efficient, clean burning fires. A fire that is inefficient is very smokey and makes the firebox and chimney dirty with flammable materials like soot and creosote. Between professional inspections it is important for you to regularly monitor the condition of your outdoor fireplace. Soot and creosote can build up inside the firebox and chimney and can make the fireplace very unsafe. If you don’t know how to recognize these build ups ask you chimney sweep to show you what to look for. If you notice a build up of soot and creosote in your fireplace have it cleaned before you build a fire in it again. We love our outdoor fireplaces and we know you do too. Make sure you maintain your fireplace in between uses to ensure a safe, cozy experience! It’s time to light a fire, pour the hot chocolate and roast those marshmallows! We put together a fun board for you to peruse, pin and pine over (after all, the nostalgia of hot chocolate is just so sweet)! Enjoy everything from Roasted Marshmallow Coffee Cocktail Shakes to creative hot chocolate mix-ins! We created an entire board on Pinterest named Hot Cocoa Bar, s0 cheers and enjoy the view! An outdoor fireplace is a great addition to any outdoor living space. It ad ds warmth, ambiance and can be a great place to hang a TV in your outdoor space. While a fireplace is nice and cozy it does require regular maintenance to function correctly and burn safely during cooler months. Here are some steps you can take to make sure your outdoor fireplace is ready to perform in the cool weather for many years. Your outdoor fireplace should be inspected at least annually by a professional chimney sweep to ensure it is clean and safe for you and your family. A regular inspection will alert you to potential problems before they become serious. Your chimney sweep will let you know when you are in need of professional cleaning. A clean fireplace is a safe fireplace. Not only does a clean fireplace look best, it also functions best. It’s tempting just to leave ashes and leftover wood in the fireplace between fires but it’s best to remove the chunks and sweep the ashes once the fire is completely extinguished and cooled. Having a set of tools specifically used for fireplaces will speed this process along. Never use a vacuum cleaner, even a shop vac, to clean ashes as embers can stay hot for days and can reignite inside your vacuum. We love our outdoor fireplaces and we know you do too. Make sure you maintain your fireplace during the summer to ensure a safe, cozy experience come fall! For generations, there has been an energy surrounding swing sets, slides, see-saws and merry-go-rounds that attracts both the young and the young-at-heart. These things may not be considered traditional outdoor furniture, but these are the fixtures that your kids will enjoy the most. 1. Check the play area – The space where you will install or build your children’s play set will have to be canvassed and scanned thoroughly. This area should be clear of any hazardous items, loose rocks, nails, and other accident-prone debris. It also has to be a spot where you can see them from inside the house so you can keep a watchful eye when they are up and about. A play area in the grass of this backyard would offer entertainment for the kids while the grown-ups lounge in the outdoor living area. 2. Choose kid-friendly materials – Kids can be very experimental with their surroundings, especially during the toddler stage. They will put anything in their mouths, and this can cause serious health issues. Never use or purchase materials that have lead in it. Check the labels just to be sure. When purchasing play sets, check for any loose screws or bolts that easily come off. These are potential choking hazard for small children. Worse, kids can get cuts and bruises as a result of poorly-constructed sets. 3. Double check the quality of the play set – Play sets are constructed with children’s safety in mind. However, being a parent, it is also your responsibility to set your own safety standards. Check and re-check the whole set to see if there are any sharp edges. If there are, make sure that they can be covered with rubber to make it safer for children to use. Installing a rubber mat at the bottom of the slide will also help your child have a smooth and softer landing spot. 4. Install safety railings – If the set you are purchasing includes a slide, your children will have to climb up to reach it. This is an accident waiting to happen, especially if you have small children running around and pushing each other to get to the top. Install safety railings to keep them from falling down. 5. Schedule regular maintenance – Conduct weekly checks if the set needs repairs. Any loose part should be immediately repaired and attached. Dangling ropes should also be carefully attached. Play areas help keep the kids entertained while you relax on the patio or bbq in your outdoor kitchen. As long as these play areas are safe, they’ll make the backyard a fun place for the whole family. Ashleigh Lynn is a writer for Open Brook, an excellent source of information and reviews about patio, garden and outdoor furniture . Garden theft is on the rise. It makes perfect sense, too. To scope a house, a thief might believe is empty, he can simply ring the doorbell. If no one answers, the burglar will then enter the backyard and search for open doors and unlocked windows. The goods are right there; ready to be taken without ever having to enter the home. There’s no reason why you should make a thief’s job easy. Patio furniture, grills, exotic plants, even garden art and lawnmowers get snagged or vandalized. Here are a few simple tips to help you secure your belongings in the back yard and keep thieves from invading your home through a back door. Document your inventory. It involves some time and effort, but taking pictures of items or videotaping your property can help you with insurance claims. List your furniture, grills, smokers, gardening tools and anything else you deem important and valuable. Make sure to create an itemized list to go with your visual proof. Make your mark. Place your name, address, zip code or other unique symbol on your belongings. Place them in discrete locations, so they won’t be noticed or removed. This will help you identify and claim them, should they be stolen. It’s wise, especially if you are using a symbol, to record where you place these identifying marks in the inventory descriptions. Nail it down. Everything from patio furniture to BBQ grills, even heavy fixtures, can be bolted down, bound with cables or cemented in place. Make ‘em run. Another option for securing items is installing alarms that create an excessive amount of noise. Cable alarms can be used for most items in your yard, including riding mowers, tables and chairs, even coolers. The costs are low and the effects are impressive. Make friends and get them involved. Neighbors are one of the best deterrents you can have. Sadly, many homeowners don’t get to know one another as they should. Simply by being aware of one another and keeping an eye out for suspicious activities, most thefts can be deterred. Fence it off. A good, strong, six-foot fence will not only keep out most burglars, it can keep animals out of your garden. If you have a fence, check for holes and damage that may need to be repaired or replaced. Do NOT rely on simple lift latches on your gate; these will not deter a thief. Install latches and use padlocks to secure gates. Light it up. If thieves hate to be noticed, one of the best deterrents is to shine a spotlight on them. The best way to do that is installing motion sensors in the backyard. Place them over or near entrances around the house. These devices are cost effective and not only provide safety; they provide extra light on those late nights when you come home. Lock it up. When you leave your home, make sure you lock the windows and doors. It may sound silly, but homeowners often forget or simply don’t mind leaving a backdoor open. Chances are a theft will happen during the day while you’re at work. Thieves, by nature, will simply find the path of least resistance, walk in, take your valuables and leave. Don’t give them that opportunity and check the house before leaving. Make sure your shed is also locked and secured with padlocks. Grow your confidence. Landscaping is a two-edged sword. Trees planted to keep a thief out can also hide him while he takes advantage of your absence. Weigh and consider the pros and cons of using plants as part of your defense. If you do decide to use live barriers, consider beautiful plants that can hinder. Rose bushes, berry bushes, Firethorn and Hawthorne are great examples to use around the windows of your home. Place them under the easiest access areas. A lawn forgotten is also a sure sign that you don’t care about your home and may have left a way in. Mow your lawn and keep your yard clean. A man’s best friend. Don’t forget that a good line of defense can also be a good friend. Dogs are a wonderful addition to the family and an effective deterrent to potential theft. Don’t want an actual dog? Post signs about the invisible beast living in the house. Keep an eye on it all. 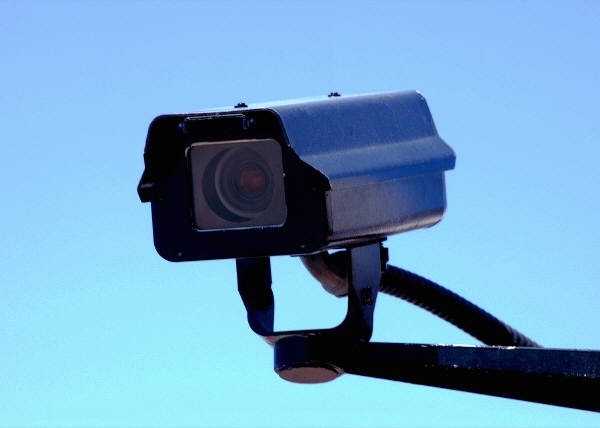 The last option, albeit it can be an expensive one, is a security camera system. You should know that a truly effective system is both costly to buy and to maintain over time. Another option, combined with the tips mentioned above, is to install fake ones. Give the dirt bags the illusion that you have your house all under control. The simple presence of a camera can encourage a thief to pick an easier target. There you have it: A list of simple, yet effective ways to deter a thief and secure your backyard and home. If you have any suggestions I may have missed, please leave a comment and share your suggestions. 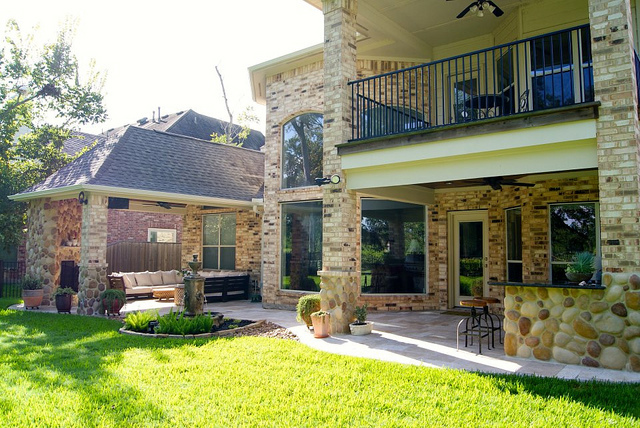 We love our new patio cover and would definitely recommend Texas Custom Patios. Our contractor, Mark, and everyone that worked on our project was professional. The patio cover looks like it was built when the house was built. They used top quality materials, the roofline is seamless, and everything matches very well. Great job completed in a timely manner and we are totally satisfied with the whole experience.